Somewhere along the United States' 2,000-mile border with Mexico is a town unconcerned by what President Donald Trump has called a border "crisis," and the New York Times is on it. "On the Border, Little Enthusiasm for a Wall: ‘We Have Other Problems That Need Fixing,'" the Times reported. The source for this claim is not polling data, but rather interviews primarily with residents of the tiny town of Columbus, N.M.
Columbus is home to residents who see little issue with their proximity to the border. The Times identified at least one citizen who seemed to wish there were more illegal immigration, not less. "The only crisis we're facing here is a shortage of labor," said Adriana Zizumbo. "Fewer people cross the border to work than before, and Americans don't want to get their hands dirty doing hard work." "America's border with Mexico is as long and as varied as the terrain," the Times noted, failing to explain why it felt the opinions of one small town might therefore represent the feelings of the people living along its entire expanse. And small Columbus is: According to the U.S. Census Bureau, Columbus Village has a population of 1,609. As of 2017, it was the 53rd-largest out of 106 incorporated places in the state, just 0.3 percent the size of largest city Albuquerque. 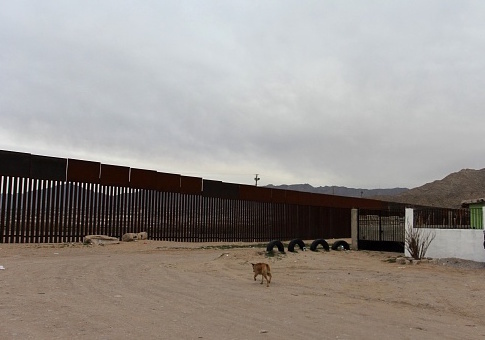 The village is home to a border crossing, which, according to official data, saw 265,000 cars and 7,000 trucks cross in 2018. By contrast, the Hidalgo Port of Entry—near President Donald Trump's Thursday visit to McAllen, Texas—saw 3.2 million passenger cars and almost 500,000 trucks pass through in 2018. Not only is Columbus both underpopulated and unpopular with border crossers, it is also in the border state that sees the fewest illegal border crossings. The entirety of the state of New Mexico (as well as two counties in west Texas) is covered by the U.S. Border Patrol's El Paso border sector. Data from the USBP show that, in absolute terms, the El Paso border sector saw just 8 percent of apprehensions in FY 2017. 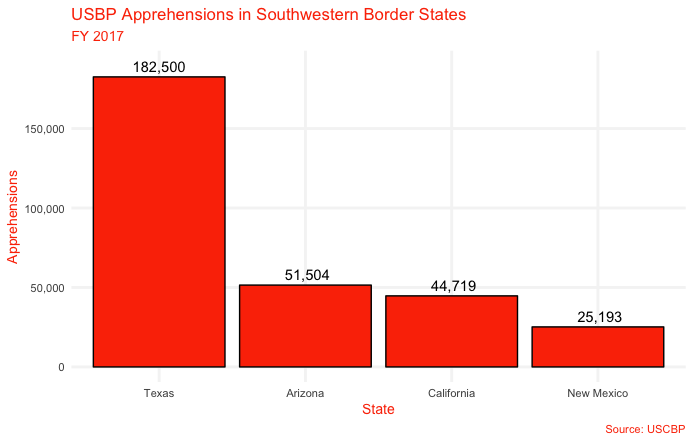 The state of New Mexico as a whole saw the fewest apprehensions of any of the four border states. In addition to several residents of Columbus, the Times also interviewed an unnamed cattle rancher in an unspecified location in southern Arizona; Kevin Malone, founder of a San Diego immigrant services group; two Texas mayors; and Honduran mother Iris Patricia Oseguera, a would-be migrant residing in Mexico. Meanwhile, more careful analysis shows complexity both as to the border situation and public opinion about it. A Politico/Morning Consult poll released Tuesday found that 42 percent of registered voters believe that there is "a crisis of illegal immigration," while another 37 percent believe there is a "problem" but not a crisis. Data from U.S. Customs and Border Protection show that while border apprehensions are at historic lows, border agents nonetheless face real challenges coping with surging family migration and the smuggling of huge volumes of drugs into the United States by Mexican drug trafficking organizations. This entry was posted in Issues and tagged Border Patrol, Media Bias, New York Times. Bookmark the permalink.